Valve might not be best known for making games these days, but they are damn good at making money. Everything they do runs like a well-oiled machine, with the bare minimum of human touch – it’s all algorithms and automated mailing systems. Most Steam refunds don’t even pass in front of human eyes. If you like things that are mostly automated, check out our list of the best MMOs. 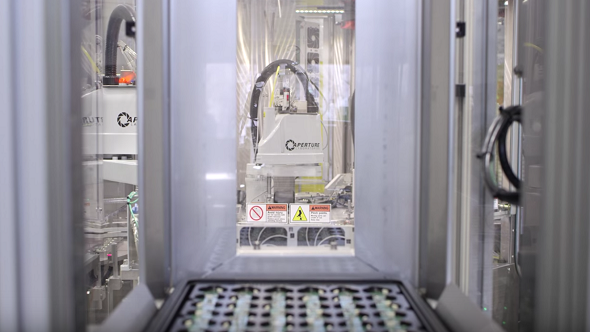 Valve have just released a video showing off their Steam Controller production line and it’s kind of mesmerising. There’s something really satisfying about watching machines do a job faster and more efficiently than you ever could, until you think about the impending robocalypse. Anyway, some of Valve’s machines have cool logos on them, like Aperture Laboratories ones, which is just the most Valve thing ever, really. It’s Willy Wonka for nerds.